[1.7.10/1.7.2/1.6.4] Brewcraft | 1.2.0 | Industrial brewing, fluid potions! Brewcraft is an expansive project that has its sights set on making some major changes to the brewing system in place in Minecraft. It aims to not replace the vanilla mechanics, but rather add and run alongside this system. To accomplish this, we have added in a wonderful machine we like to call the Brewery. This machine unlocks an entirely new process of brewing, which allows the creation of not only all of the vanilla potions, but also an array of potions we have added for ourselves. We have also added in machines and such which make potions and fluids more applicable to the Minecraft world; a potion Sprayer which mists potions over an area, Kegs to hold them. . . but don't let be spoil everything, try it for yourself! Go on the mod ! U did a great job! Thanks! I worked for quite a while to translate it into all those different languages! A use for wheat and my endless supply of sugar canes? Great! Are the milk bottles and Chateau Romani bottles stackable? Would understand if the second wasn't though since that would be a little too effective. But I think it needs a little more tweaking for lots of positive effects. Maybe gold nugget, glowstone dust or just something a bit more expensive? You didn't translate it into Pirate Speak? Horrible mod, will never DL, gripe moan etc. etc. I don't think I personally will have a use for this, but just so this post isn't useless, I'll DL it and give it a try. I could add some more expensive elements into the recipe for Chateau Romani. It would balance it out, to some extent. I agree with your statement about tweaking - this is alpha 0.0.1, so bugs can be expected. Funny. I could have sworn I actually did translate it into Pirate Speak. . .
EDIT - I actually checked in game, and yeah, I did translate it in the release version. (i.e. The Bottled Milk translated to "Milk in tha Bottle".) Unless you were joking about it not being translated. . .
Not to worry about this mod being useless; I did have a couple ideas for this that may gain some attention. Is it just me or does the changelog link to the photo gallery? You know, you're right. I'll fix that immediately. EDIT - Just fixed that. Don't know why that didn't work correctly. The update using the FireHandler will *possibly* be out later today, so stay tuned! What will the fire in a bottle do anyways? Or Is that secret stuff? It will be used to brew a couple different drinks, along with some other things. I'm still not entirely sure about the full extent of the Bottled Fire's abilities. Maybe you drink it like a potion and it sets fire around where you walk on? Or shoots some fire projectile? Not sure. And also not sure how that's even useful. Well, it doesn't have to have a purpose. So far, it can place/pick up fire, and will be used to brew certain beverages. . .I'm sure I'll add in some more cool stuff later. Right now, I'm almost finished with a drink that gives you fire resistance and some other effects, but if you drink it in the Nether, it amplifies the effects, and does some other cool stuff. Don't want to give anything away, but I might add in a custom brewing system (block) for some of the drinks. - Added Ghastly Brew, Bottled Fire, Bottled Ghast, and Lon Lon Milk. - Tweaked some recipes and nerfed a couple drinks. Nice mod.I think it would be nice in hexxit. Thanks! I worked very hard on this! 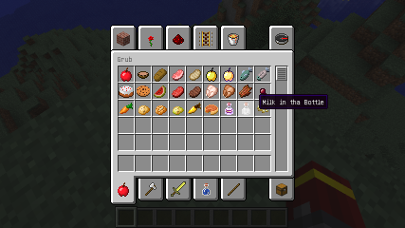 I'll be attempting to add an advanced brewing block that allows you to brew all of these drinks, because I'd like to stay away from the crafting table. . .
Hope that turns out well! I don't think I'll be making a 1.5.2 version, sorry. . .
A lot of methods, names, etc. have either been changed or don't exist in 1.5.2. Some of the stuff wouldn't work or would have to be majorly changed to make a 1.5.2 version. I'm in the process of creating a brewery system. It will take some time, considering GUIs aren't really my thing. I hope it turns out well so I can share it! Good luck! Going to try the mod out now.